In an effort for NIU and its students to become more environmentally friendly – and to promote sustainability – attention should be brought to the use of disposable water bottles. By focusing on giving people alternatives for carrying water while highlighting the negative impacts of disposable water bottles, there is an opportunity to make noticeable changes to how we think of sustainable lifestyle choices. To motivate students to rely on personal water bottles, free NIU-branded reusable water bottles are provided at events this initiative supports. Through years of support from the Division of Marketing and Communications, this initiative will have passed out 4,500 water bottles by the end of fall 2014. 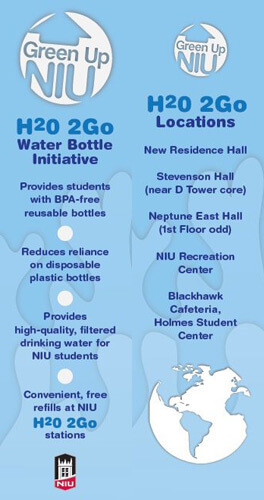 H2O 2Go passed out 2,000 reusable water bottles to NIU students in the fall of 2012. 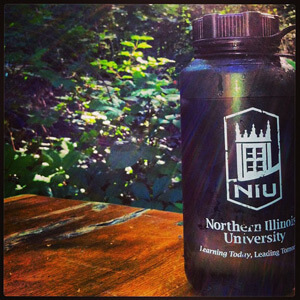 Since the first session was successful, 2,500 NIU-branded bottles will be distributed in the fall of 2014. Want a reusable water bottle? Head to the President’s Picnic from 3 to 7 p.m. Sunday, Aug. 24, at the East Lagoon. First come, first served! In addition to reducing disposable water bottles on campus, this project’s objective is also to install water bottle refill stations. These stations give access to cold, filtered water to easily reusable water bottles, and are a practical alternative to standard tap water. At the start of this initiative, there were five hydration stations installed across campus. Now there are more than 25, thanks to the Division of Operations and Community Relations. DuSable Hall will have a hydration station inside; H2O 2Go proudly recommended this installation. More stations are needed in academic buildings and H2O 2Go is working to fulfill this need. The water bottles and hydration stations can work together when more students know about both and do not want to use disposable bottles. In an attempt to explain the goals of this project to individuals using NIU’s campus, multiple posters will be displayed to tell about the problems with disposable water bottles and to offer motivation to use reusable water bottles. NIU Document Services will provide promotional material to support H2O 2Go this fall. In all, this project not only brings further sustainability to the university, but also gives the school public relations value and educational value. As for the PR value, the campaign can fulfill the goals set forth by the NIU President Doug Baker and shows that NIU works toward its goals with students. It can show that the university is becoming more sustainable and environmentally conscious. For educational purposes, NIU students, faculty and staff can be taught to be more aware of their consumption. This campaign is meant to show everyone a more sustainable lifestyle without making more work for individuals. Joshua Nixon is a senior in the College of Engineering and Engineering Technology’s Energy and Environmental Technology emphasis with a minor in Women’s Studies. He is head of promotion and marketing for H2O 2Go.